On the Z8 there have been reports of the sprung exhaust connection becoming unseated and leaking. If you can cover your exhaust while running and it doesn't build pressure, it is leaking somewhere. It is unclear as to the reason but as in mine, it is observed that there are some with the correct spring tension and some without. 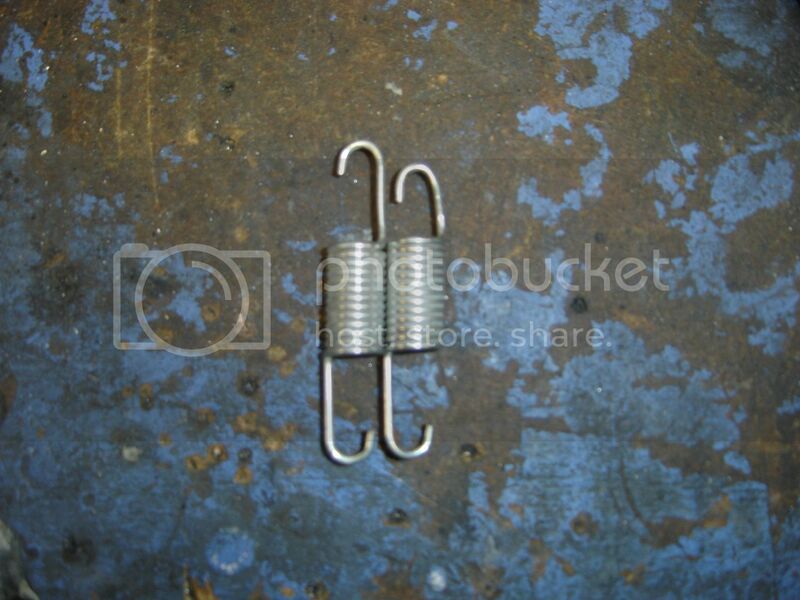 For exhaust spring connections the standard amount the spring should be stretched is 20% of it's tip to tip length. For example a spring sitting on the table measures 76mm. 20% of that is 15.2mm but we'll round that to 15mm. So installed it should measure tip to tip about 91mm. Although the parts list show all the CFMoto z8 exhaust springs to be the same which measure that 76mm, none of the hangers except one on mine measure anywhere close to that 91mm. I have one at 77mm, one at 80mm and one at 92mm. It is unclear if this is a manufacturing problem or if heat is causing the mounts to change their position. I will know if after this adjustment and new springs if the distance between the hangers changes. It is clear to me that heat is not effecting the springs themselves though and that these springs, unlike what we would buy here, are a softer material are can be bent as needed. So, I have ordered two sets of Moose Racing 63mm springs for my worst one, the one at the muffler and have shortened the springs on the next worst, the one at the front cylinder. This is the one that is closest to being correct. The one off the rear cylinder. If all yours look something like this, you are OK.
And this one is the front cylinder which has about a 5% stretch on it. These will get shortened. You can just place the spring in a vise, straighten out one end, clip-off a 1/4- 1/2" of material and re-bend closer to the spring making it shorter. You can do this on both sides if necessary but I just needed one side. Here's a before and after shot. 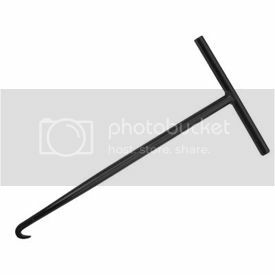 You will need a spring hook like this but you can bend a 16 penny nail's tip to look like it and hole it with vise grips. Got the springs from here. Kinda pricey considering the CFMoto springs are .90c each where these are 13 bucks for 2 but maybe you get what you pay for. These 63mm are for the one that has the hangers at 77mm. Any farther apart and these wouldn't be right but Moose makes a lot of different sizes. Very good write up. Great pics. Where did you get those moose springs you spoke of? The Moose springs came in today and after a few choice words, they got installed. Not as easy as the CFMoto springs to stretch. But it's a solid connection now. All of my ZFORCE 800 units have come back for spring failure where the y pipe connects to the muffler. I believe that it's the fact they use the same size spring through out the entire machine. That particular connection requires a shorter spring as NM pointed out. Good, so it's not just mine. Can probably just shorten the OE springs but I think to get them down to about 63mm you will have to clip and re-bend both ends, not just the one side...maybe not. I'll test on one of my extra springs and see. To get at the springs at the rear of the motor, can I get to them by removing the cover in the bottom of the cargo box or would it best to remove the cargo box, panels etc. to do the springs an any gasket replacement? Thanks for any input. I didn't remove anything to do the rear ones but it was a little awkward. I just use a bent nail and vice grip. That gave me the ability to adjust my pull-angle as needed. Mine hadn't leaked enough to damage the gaskets so they didn't get replaced. Thanks NMK, once all the parts are in and the weather warms up will giving it a shot. My exhaust stated leaking awhile back. Today I looked the exhaust system over to see just where the leak is. 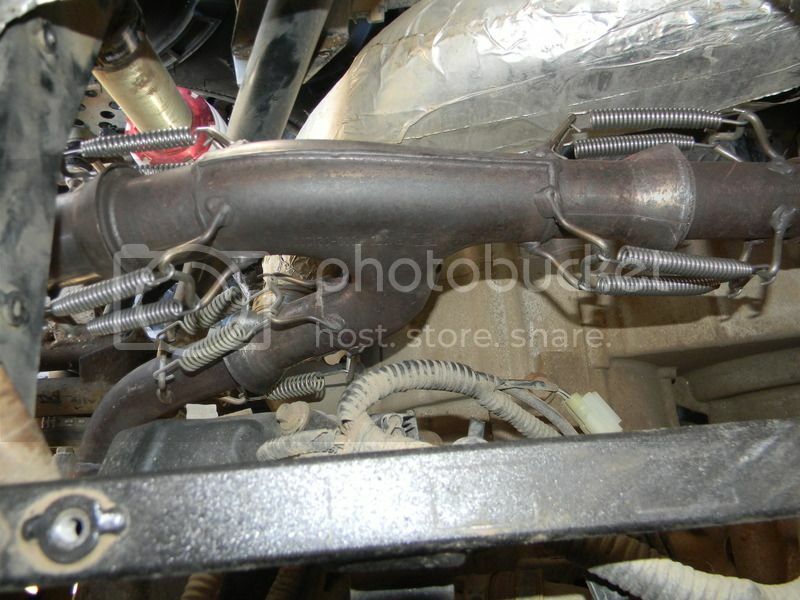 It is at the joint where the muffler connect to the exhaust system. 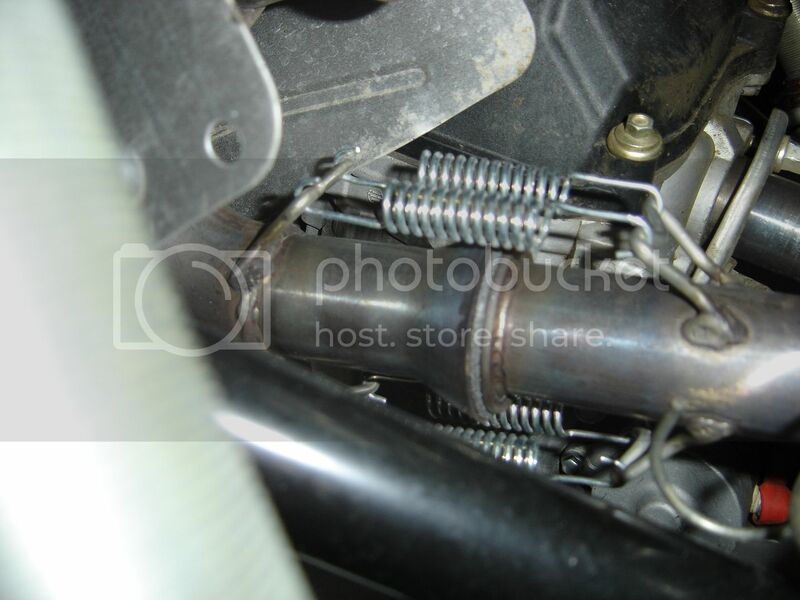 In the following photo the joint with springs on it is where the muffler connects to the exhaust pipe. The muffler joint looks well seated. 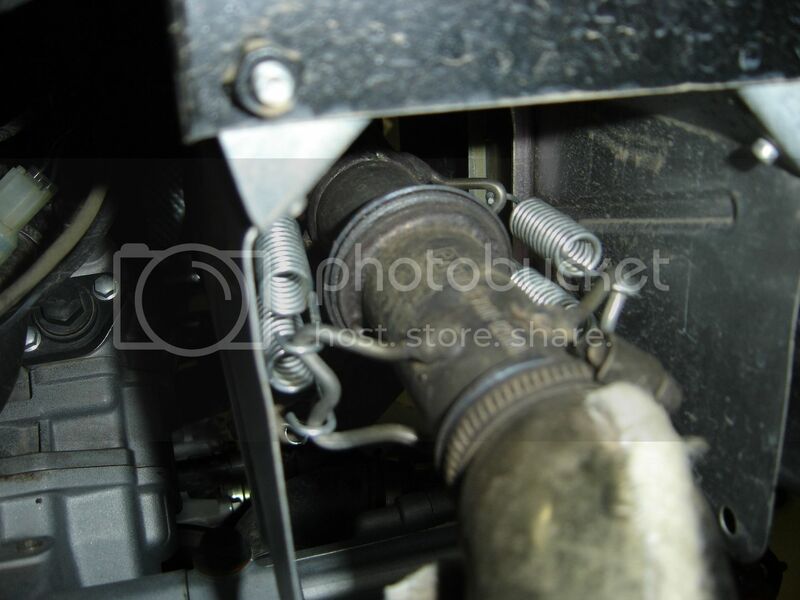 The joint that has no springs (showing separation) on it is the one which connects to the front cylinder exhaust. 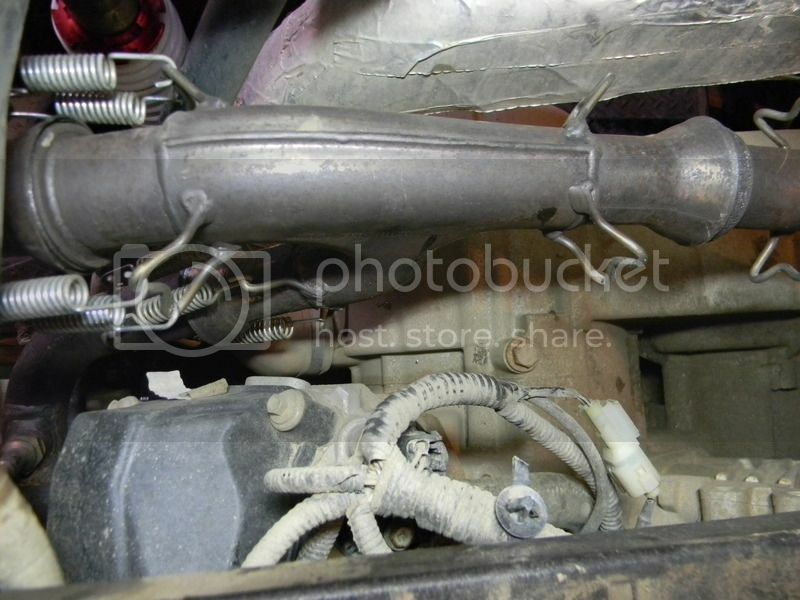 In the above photo is the joint where the muffler connects to the exhaust pipe. This time the springs are back on the connection at the exhaust join for the front cylinder which is well seated. As you can see the muffler joint is no longer well seated. This is where the exhaust is leaking. The gasket at this connection looked find to me, it just seems the fit at the joint is the problem. If I put shorter springs on to pull the joints together, will this causes stress on other parts of the exhaust system leading to other problems. 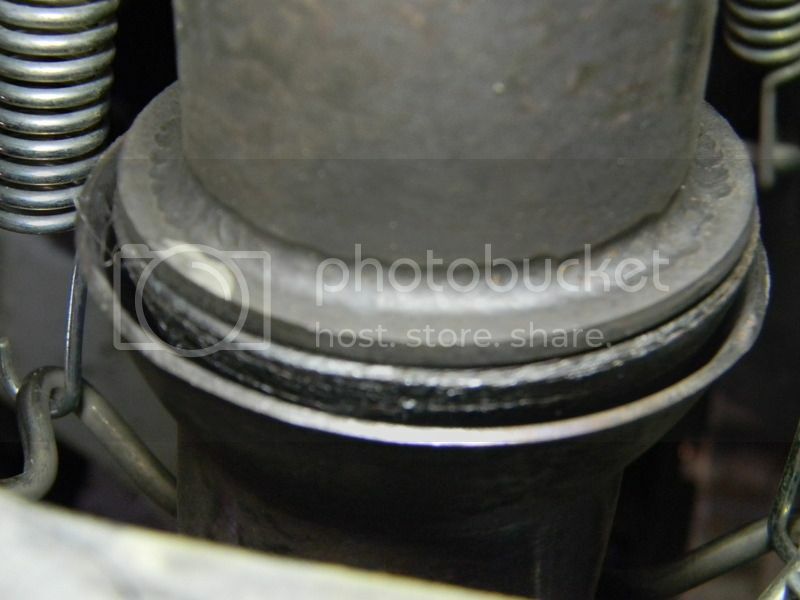 Or, is there something more going on to cause the muffler joint not to seat in place? 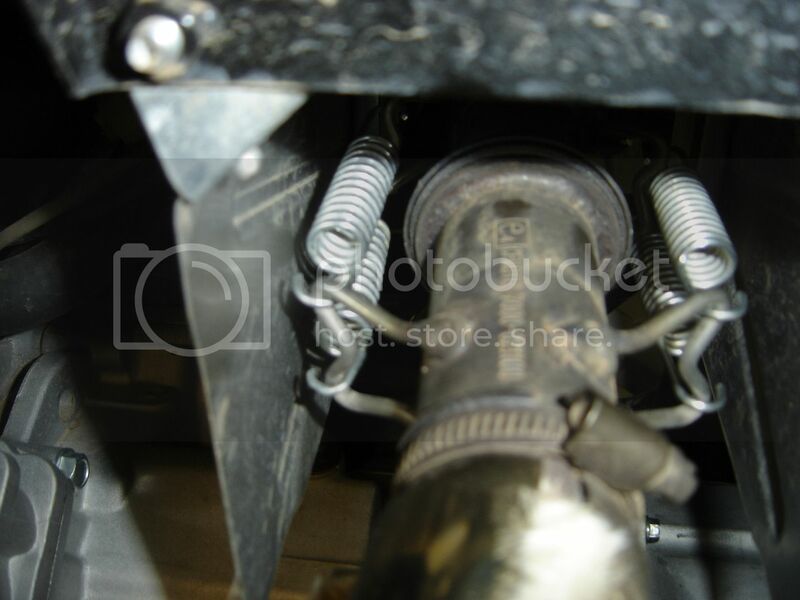 The other joints in the exhaust system are well seated. I found that because the engine is rubber-mounted, it can torque to the front or back, pushing or pulling on the exhaust system. The muffler is solid-mounted by those tabs to the upper frame and they can rotate during one of those torque moves, then at rest, the joints are apart like yours. 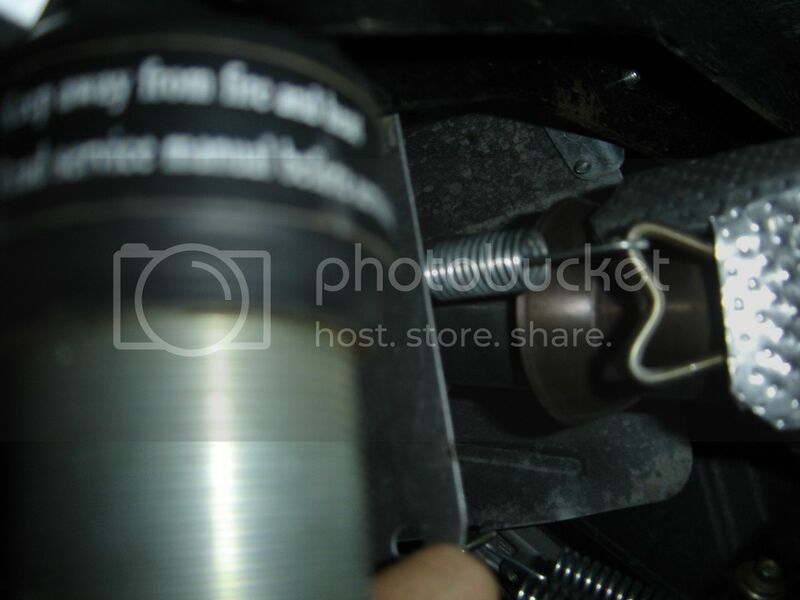 So, loosen both the bolts on the muffler and wiggle the joint to reset. Also the gasket-side has a noise that can get hooked on the edge of the receiver side and hold it open. I have not had the problem after the new springs but...with the muffler mounted solid, I could again. Hmmm..food for thought about having those bolts slightly loose or pivet a bit. Thanks NMK, will give it a shot tomorrow and see if I can get the muffler to seat better in the joint, also, the new springs I order (moose) will be here tomorrow in the mail. A couple if times at first mine were held apart on the edge and all I had to do was give it a shake. Funny they made the engine to move slightly but mounted something to it with hard mounts. I did as you suggested NMK. I loosen the two bolts on either side of the muffler which allowed it to seat into the exhaust joint. I installed the new moose springs, 63MM on the muffler joint and 75MM springs on the front cylinder exhaust joint and then tighten the two bolts up on the muffler. All is good now, no leaks. Thanks again NMK for the info on this, being able to do these small jobs myself sure save me time and labour costs. At least you know the heat won't get to them. Do check your engine mount bolts though...some have found them loose.